Would you please tell me how do I get "KinemeGLLinePatch". I am trying to make Griffith type of thing and I did install Kineme GL Tool, but the problem is still there, line is pixelated. I am new to Quarts and Kineme, and extremely happy to be a part of this community, amazing work that you folks do. Make sure you installed your GLTools to ~/Library/Graphics/Quartz Composer Patches folder, you will in all probability have to create such a folder, as one is not created by default in your home Library folder, which is where one is recommended to install almost all of Kineme's patch plugins. Thanks for your probabilities, I did install the GLTool plugin to “Quartz Composer patches” directory, I mean drag and drop it there after downloaded from the site. I can see the line and spline from Kinme in my patch creator window. Now when I open particle paint.qtz, I get this window which says “"KinemeGLLinePatch" is missing. I am running 10.5.6 and after I open this composition, I could paint but it is pixilated and not a line. Should I do some thing to ParticleTool.xcodeproj file in Xcode before I launch the particle compositions? Is there a good composition to inposrt random Quicktime and images files to run with music? You will also need to download the Particle Tools patch and install that, although by the sounds of it you've already downloaded it to get the Particle paint composition that provoked your first enquiry. after I open this composition, I could paint but it is pixilated and not a line. Particle paint is like that sprite looking on the paint side until you tweak it. The lines in that example comp are just to provide some kind of framing, they are fixtures if you like, not active objects. You paint with the Kineme Particle in that composition. message though does it :-\ . 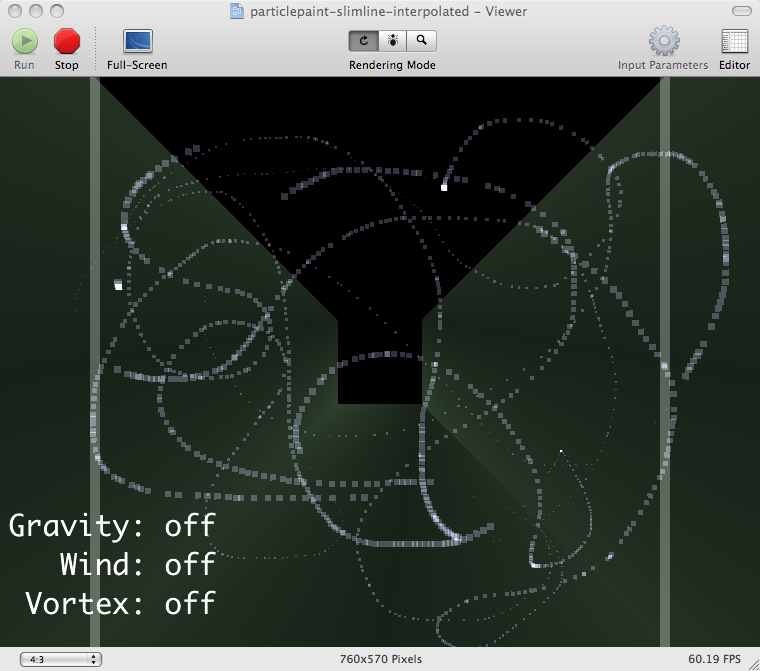 I have attached a very slightly revamped version of the particlepaint application for you to open and try out. Only things I've done are to add in an Interpolator to tweak the size and area of the Object Particle and the Object settings. Please try it out and let us know if this provokes the same problem for you, for I know that this is working for me. When you open up the particle paint file you had problems with do you actually see three Kineme GL lines upon that editor stage? It is working thanks, I just wanted to know on a little more tech side, Is there an interpolator, which changes size and area over speed rather time? this way if the speed is faster line is thiner. Peter, You did a mistake answering my question…. ☺, I am going to bug you more, but thanks for answering my curiosities, as I am not a programmer but have done some scripting and worked on several motion pictures, including Final Fantasy. I found this area is the most intriguing and I feel like future for my research is laying here with these tools. So I am trying to learn even further and trying to find out how to turn “enable” on and of without Left Mouse Button. Is there a simple documentation where I could start learning these patches more? Thanks a lot for your kind help in advance. Well, pull up an lfo, set it to square, and adjust the period to the length of "off/on" that you want... and then hook it to whichever input is in question. In QC a 0 is "off", a 1 is "on", and that holds true in pretty much every scenario I can think of. You can also setup an interpolate patch, and a "round" patch... In interpolate has settings for no repeat, loop, mirrored loop, mirrored loop once, as well as timing curves. That gives a great deal of variety in what you can "do". By using an interpolate+ range, and making your interpolate go from a range of 0-.5ish, or .4ish to 1, you can make the lengths of off/on time differ from one another. With the lfo square wave approach, off and on time will be equal. You can pull up the stock apple audio patch, and hook the volume out put to any port. You can also put a math patch in between to multiply the value output. Typical ideas would be to connect the volume to coordinate positions, or to the size, or perhaps to make peaks enable certain forces. If you use kineme audio file patch (which is necessary for offline rendering), it is a similar process, but you would want to attach a structure member to the output, select 0 or 1 (left or right feed), and then attach it to the rest of your chain. If you hook an rgb to color, or hsl to color patch to any kind of color input, and then pipe your audio output to one of those values, you will get color change going. Audio can generate a tremendous amount of info. In certain settings, qtz can't quite keep up with the amount of values being generated, because you are making the renderer, or other patches, do too much and QC can barely keep up. In those scenarios, introducing a smooth patch after your volume peak, or frequency info, can improve a composition's performance sometimes. For something like an audio reactive, it's not fun if it's barely keeping up. Apart from the copious links to be found on Apple's Developer site, there are various Wikis, blogs and such that provide much in the way of useful information. This site has got much in the way of Wiki documentation, plus other references for some of the Apple patches in detail and for the Kineme patches in obviously far greater detail. Almost all the really comprehensive and insightful documentation, observations and tutorials, barring a few I've as yet to include, are on the resources page link I sent to you , above. The gist is... poke around the Apple Developer site, and there is a section called sample code.. there is useful stuff there. Look at the sample code link on the same page, and that can be fairly useful. The example compositions in the source code here at Kineme also illustrate many fundamental principles, as have many posts on the Developer list. This may sound over the top, but if you really want to understand as much as possible, it's not a bad idea to look through the developer list archives from the beginning. Other mainstays would include quartzcompositions.com, and sites by sam kass, toneburst, psonice, memo, momo the monster and of course the futurismo example lab. The developer folder examples are really MOST useful. Many of them are well annotated inside, explaining what each part does (some aren't annotated at all). The most I've learned has come out of looking at the developer folder and sample qtz's in the plugin sources here, more so than anything else, and just "doing stuff" and patching in and modifying until it reached a point where I started to understand enough to do things from scratch. Are you opening this Particle Tools dependent composition whilst running QC in 32 bit mode, Abhi? If not, highlight the QC application in your Developer Tools folder [whilst not running QC], press Command and I [i] together to get the application file's information and check the 'Open in 32 bit mode' radio button, start QC, then try opening the same file again. If you still don't find success doing things that way with this Particle Tools composition, please post the composition for further examination and feedback.